The comprehensive guide to our fully integrated line of gaming products including bingo paper, bingo ink markers and displays, pull tabs and equipment. This catalog also incorporates product knowledge, sales tips and ways to play. New pull tab offerings and classics that keep on selling in one handy reference, plus informative and educational support including "What is a bingo game event?" or "Seal card advantages." Winners make players! Increase your pull tab sales and increase your profits. 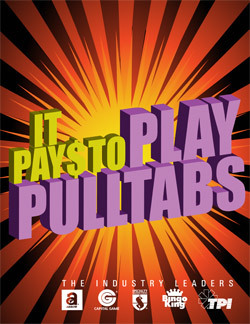 From the industry leaders, this resource is full of sales support, game ideas and reasons to play 25¢ and 50¢ pull tabs.